Geriatrics or geriatric medicine is a specialty that focuses on health care of elderly people. It aims to promote health by preventing and treating diseases and disabilities in older adults. There is no set age at which patients may be under the care of a geriatrician or geriatric physician, a physician who specializes in the care of elderly people. Rather, this decision is determined by the individual patient's needs, and the availability of a specialist. It is important to note the difference between geriatrics, the care of aged people, and gerontology, which is the study of the aging process itself. The term geriatrics comes from the Greek γέρων geron meaning "old man", and ιατρός iatros meaning "healer". However, geriatrics is sometimes called medical gerontology. The decline in physiological reserve in organs makes the elderly develop some kinds of diseases and have more complications from mild problems (such as dehydration from a mild gastroenteritis). Multiple problems may compound: A mild fever in elderly persons may cause confusion, which may lead to a fall and to a fracture of the neck of the femur ("broken hip"). Elderly people require specific attention to medications. Elderly people particularly are subjected to polypharmacy (taking multiple medications). Some elderly people have multiple medical disorders; some have self-prescribed many herbal medications and over-the-counter drugs. This polypharmacy may increase the risk of drug interactions or adverse drug reactions. In one study, it was found that prescription and nonprescription medications were commonly used together among older adults, with nearly 1 in 25 individuals potentially at risk for a major drug-drug interaction. Drugs metabolites are excreted mostly by the kidneys or the liver, which may be impaired in the elderly, necessitating medication adjustment. The presentation of disease in elderly persons may be vague and non-specific, or it may include delirium or falls. (Pneumonia, for example, may present with low-grade fever and confusion, rather than the high fever and cough seen in younger people.) Some elderly people may find it hard to describe their symptoms in words, especially if the disease is causing confusion, or if they have cognitive impairment. Delirium in the elderly may be caused by a minor problem such as constipation or by something as serious and life-threatening as a heart attack. Many of these problems are treatable, if the root cause can be discovered. The so-called geriatric giants are the major categories of impairment that appear in elderly people, especially as they begin to fail. These include immobility, instability, incontinence and impaired intellect/memory. Impaired vision and hearing loss are common chronic problems among older people. Hearing problems can lead to social isolation, depression, and dependence as the person can no longer talk to other people, receive information over the telephone, or engage in simple transactions, such as talking to a person at a bank or store. Vision problems lead to falls from tripping over unseen objects, medicine being taken incorrectly because the written instructions could not be read, and finances being mismanaged. Functional abilities, independence and quality of life issues are of great concern to geriatricians and their patients. Elderly people generally want to live independently as long as possible, which requires them to be able to engage in self-care and other activities of daily living. A geriatrician may be able to provide information about elder care options, and refers people to home care services, skilled nursing facilities, assisted living facilities, and hospice as appropriate. Frail elderly people may choose to decline some kinds of medical care, because the risk-benefit ratio is different. For example, frail elderly women routinely stop screening mammograms, because breast cancer is typically a slowly growing disease that would cause them no pain, impairment, or loss of life before they would die of other causes. Frail people are also at significant risk of post-surgical complications and the need for extended care, and an accurate prediction—based on validated measures, rather than how old the patient's face looks—can help older patients make fully informed choices about their options. Assessment of older patients before elective surgeries can accurately predict the patients' recovery trajectories. One frailty scale uses five items: unintentional weight loss, muscle weakness, exhaustion, low physical activity, and slowed walking speed. A healthy person scores 0; a very frail person scores 5. Compared to non-frail elderly people, people with intermediate frailty scores (2 or 3) are twice as likely to have post-surgical complications, spend 50% more time in the hospital, and are three times as likely to be discharged to a skilled nursing facility instead of to their own homes. Frail elderly patients (score of 4 or 5) who were living at home before the surgery have even worse outcomes, with the risk of being discharged to a nursing home rising to twenty times the rate for non-frail elderly people. geriatric physical examination of interest especially to physicians & physician assistants. Orthogeriatrics (close cooperation with orthopedic surgery and a focus on osteoporosis and rehabilitation). Geriatric nursing (focuses on nursing of elderly patients and the aged). Ayurveda (before 1500 BC), the ancient Indian system of medicine, has mentioned about the eight branches (Ashtanga Ayurveda) of Ayurveda viz kayachikitsa (general medicine), balaroga (paediatrics), graha chikitsa (treatment of diseases related to psychology), urdhvanga chikitsa (treatment of the diseases of the head and neck, ENT), shalya tantra (surgery), damshtra (treatment of poisonous stings and bites), Jara/Rasayana (geriatrics) and vajikarana (andrology). So it can be said that geriatrics was first mentioned in Ayurveda. The term geria is very close to the Sanskrit word jara. Rasayana is defined as "Rasayanam cha tat jneyam yat jara vyadhi nashanam", which means rasayana is a branch of medicine which deals with the prevention of premature ageing, management of diseases and especially the management of diseases related to Old age. The Canon of Medicine, written by Avicenna in 1025, was the first book to offer instruction in the care of the aged, foreshadowing modern gerontology and geriatrics. In a chapter entitled "Regimen of Old Age", Avicenna was concerned with how "old folk need plenty of sleep" and how their bodies should be anointed with oil, and recommended exercises such as walking or horse-riding. Thesis III of the Canon discussed the diet suitable for old people, and dedicated several sections to elderly patients who become constipated. The Arabic physician Algizar (circa 898–980) wrote a special book on the medicine and health of the elderly. He also wrote a book on sleep disorders and another one on forgetfulness and how to strengthen memory, and a treatise on causes of mortality. Another Arabic physician in the 9th century, Ishaq ibn Hunayn (died 910), the son of Nestorian Christian scholar Hunayn Ibn Ishaq, wrote a Treatise on Drugs for Forgetfulness. George Day published the Diseases of Advanced Life in 1849, one of the first publications on the subject of geriatric medicine. The first modern geriatric hospital was founded in Belgrade, Serbia, in 1881 by doctor Laza Lazarević. 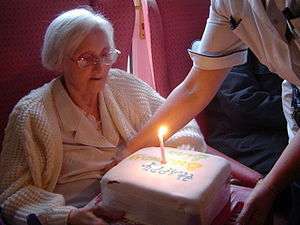 Modern geriatrics in the United Kingdom began with the "mother" of geriatrics, Dr. Marjorie Warren. Warren emphasized that rehabilitation was essential to the care of older people. Using her experiences as a physician in a London Workhouse infirmary, she believed that merely keeping older people fed until they died was not enough; they needed diagnosis, treatment, care, and support. She found that patients, some of whom had previously been bedridden, were able to gain some degree of independence with the correct assessment and treatment. The practice of geriatrics in the UK is also one with a rich multi-disciplinary history. It values all the professions, not just medicine, for their contributions in optimizing the well-being and independence of older people. Another "hero" of British geriatrics is Bernard Isaacs, who described the "giants" of geriatrics mentioned above: immobility and instability, incontinence, and impaired intellect. Isaacs asserted that, if examined closely enough, all common problems with older people relate to one or more of these giants. The care of older people in the UK has been advanced by the implementation of the National Service Frameworks for Older People, which outlines key areas for attention. In the United States, geriatricians are primary-care physicians (D.O. or M.D.) who are board-certified in either family medicine or internal medicine and who have also acquired the additional training necessary to obtain the Certificate of Added Qualifications (CAQ) in geriatric medicine. Geriatricians have developed an expanded expertise in the aging process, the impact of aging on illness patterns, drug therapy in seniors, health maintenance, and rehabilitation. They serve in a variety of roles including hospital care, long-term care, home care, and terminal care. They are frequently involved in ethics consultations to represent the unique health and diseases patterns seen in seniors. The model of care practiced by geriatricians is heavily focused on working closely with other disciplines such as nurses, pharmacists, therapists, and social workers. In the United Kingdom, most geriatricians are hospital physicians, whereas some focus on community geriatrics. While originally a distinct clinical specialty, it has been integrated as a specialisation of general medicine since the late 1970s. Most geriatricians are, therefore, accredited for both. In contrast to the United States, geriatric medicine is a major specialty in the United Kingdom; geriatricians are the single most numerous internal medicine specialists. In Canada, there are two pathways that can be followed in order to work as a physician in a geriatric setting. Medical doctors (M.D.) can complete a three-year core internal medicine residency program, followed by two years of specialized geriatrics residency training. This pathway leads to certification, and possibly fellowship after several years of supplementary academic training, by the Royal College of Physicians and Surgeons of Canada. Medical doctors (M.D.) can opt for a two-year residency program in family medicine and complete a one-year enhanced skills program in care of the elderly. This post-doctoral pathway is accredited by the College of Family Physicians of Canada. Many universities across Canada also offer gerontology training programs for the general public, such that nurses and other health care professionals can pursue further education in the discipline in order to better understand the process of aging and their role in the presence of older patients and residents. In India, Geriatrics is a relatively new speciality offering training and 3 year post graduate residency (M.D) training can be joined for after completing the 5.5 year undergraduate training of MBBS. Unfortunately, only four major institutes provide M.D in Geriatric Medicine and subsequent training. Training in some institutes are exclusive in the Department of Geriatric medicine, with rotations in Internal medicine, medical subspecialties etc. but in certain institutions, are limited to 2-year training in Internal medicine and subspecialities followed by one year of exclusive training in Geriatric Medicine. In July 2007, the Association of American Medical Colleges (AAMC) and the John A. Hartford Foundation hosted a National Consensus Conference on Competencies in Geriatric Education where a consensus was reached on minimum competencies (learning outcomes) that graduating medical students needed to assure competent care by new interns to older patients. Twenty-six (26) Minimum Geriatric Competencies in eight content domains were endorsed by the American Geriatrics Society (AGS), the American Medical Association (AMA), and the Association of Directors of Geriatric Academic Programs (ADGAP). The domains are: cognitive and behavioral disorders; medication management; self-care capacity; falls, balance, gait disorders; atypical presentation of disease; palliative care; hospital care for elders, and health care planning and promotion. Each content domain specifies three or more observable, measurable competencies. Perhaps the most pressing issue facing geriatrics is the treatment and prevention of delirium. This is a condition in which hospitalized elderly patients become confused and disoriented when confronted with the uncertainty and confusion of a hospital stay. The health of the patient will decline as a result of delirium and can increase the length of hospitalization and lead to other health complications. The treatment of delirium involves keeping the patient mentally stimulated and oriented to reality, as well as providing specialized care in order to ensure that her/his needs are being met. The Hospital Elder Life Program (HELP) is an model of hospital care developed at the Yale University School of Medicine. It is designed to prevent delirium and functional decline among elderly individuals in the hospital inpatient setting. HELP uses a core team of interdisciplinary staff and targeted intervention protocols to improve patients' outcomes and to provide cost-effective care. Unique to the program is the use of specially trained volunteers who carry out the majority of the non-clinical interventions. In up to 40% of the cases, incident delirium can be prevented. To that end, HELP promotes interventions designed to maintain cognitive and physical functioning of older adults throughout the hospitalization, maximize patients' independence at discharge, assist with the transition from hospital to home and prevent unplanned hospital readmissions. Customized interventions include daily visitors; therapeutic activities to provide mental stimulation; daily exercise and walking assistance; sleep enhancement; nutritional support and hearing and vision protocols. HELP has been replicated in over 63 hospitals across the world. Although the majority of the sites are based in the United States located in 25 different states, there is a growing international presence. International sites include: Australia, Canada, the Netherlands, Taiwan and the United Kingdom. Pharmacological constitution and regimen for older people is an important topic, one that is related to changing and differing physiology and psychology. Psychological considerations include the fact that elderly persons (in particular, those experiencing substantial memory loss or other types of cognitive impairment) are unlikely to be able to adequately monitor and adhere to their own scheduled pharmacological administration. One study (Hutchinson et al., 2006) found that 25% of participants studied admitted to skipping doses or cutting them in half. Self-reported noncompliance with adherence to a medication schedule was reported by a striking one-third of the participants. Further development of methods that might possibly help monitor and regulate dosage administration and scheduling is an area that deserves attention. Another important area is the potential for improper administration and use of potentially inappropriate medications, and the possibility of errors that could result in dangerous drug interactions. Polypharmacy is often a predictive factor (Cannon et al., 2006). Research done on home/community health care found that "nearly 1 of 3 medical regimens contain a potential medication error" (Choi et al., 2006). Elderly persons sometimes cannot make decisions for themselves. They may have previously prepared a power of attorney and advance directives to provide guidance if they are unable to understand what is happening to them, whether this is due to long-term dementia or to a short-term, correctable problem, such as delirium from a fever. Geriatricians must respect the patients' privacy while seeing that they receive appropriate and necessary services. More than most specialties, they must consider whether the patient has the legal responsibility and competence to understand the facts and make decisions. They must support informed consent and resist the temptation to manipulate the patient by withholding information, such as the dismal prognosis for a condition or the likelihood of recovering from surgery at home. Elder abuse is the physical, financial, emotional, sexual, or other type of abuse of an older dependent. Adequate training, services, and support can reduce the likelihood of elder abuse, and proper attention can often identify it. For elderly people who are unable to care for themselves, geriatricians may recommend legal guardianship or conservatorship to care for the person or the estate. End-of-life issues & Do Not Resuscitate (DNR) orders. ↑ Fletcher C; Peto R (1977). "The natural history of chronic airflow obstruction". Br Med J. 1 (6077): 1645–8. doi:10.1136/bmj.1.6077.1645. PMC 1607732 . PMID 871704. ↑ Qato, DM; Alexander GC; Conti RM; Johnson M; Schumm P; Lindau ST (24 December 2008). "Use of prescription and over-the-counter medications and dietary supplements among older adults in the United States". JAMA. 300 (24): 2867–2878. doi:10.1001/jama.2008.892. PMC 2702513 . PMID 19109115. Retrieved 2011-11-11. ↑ Lascaratos, J.; Poulacou-Rebelacou, E. (2000). "The roots of geriatric medicine: Care of the aged in Byzantine times (324-1453 AD)". Gerontology. 46 (1): 2–6. doi:10.1159/000022125. PMID 11111221. ↑ Howell, Trevor H. (January 1987). "Avicenna and His Regimen of Old Age". Age and Ageing. 16 (1): 58–9. doi:10.1093/ageing/16.1.58. PMID 3551552. ↑ Howell TH (1972). "Avicenna and the care of the aged". Gerontologist. 12 (4): 424–6. doi:10.1093/geront/12.4.424. PMID 4569393. ↑ Pitskhelauri GZ; Dzhorbenadze DA (1970). "Gerontology and geriatrics in the works of Abu Ali Ibn Sina (Avicenna) (on the 950th anniversary of the manuscript, Canon of Medical Science)". Sov Zdravookhr (in Russian). 29 (10): 68–71. PMID 4931547. 1 2 Al Jazzar Archived 6 July 2008 at the Wayback Machine. 1 2 "History of the development of geriatric medicine in the UK"
↑ Barton A; Mulley G (April 2003). "History of the development of geriatric medicine in the UK". Postgrad Med J. 79 (930): 229–34; quiz 233–4. doi:10.1136/pmj.79.930.229. PMC 1742667 . PMID 12743345. Society of Certified Senior Advisors (2009). Working with Seniors Health, Financial and Social Issues". Cannon KT; Choi MM; Zuniga MA (June 2006). "Potentially inappropriate medication use in elderly patients receiving home health care: a retrospective data analysis". Am J Geriatr Pharmacother. 4 (2): 134–43. doi:10.1016/j.amjopharm.2006.06.010. PMID 16860260. Gidal BE (January 2006). "Drug absorption in the elderly: biopharmaceutical considerations for the antiepileptic drugs". Epilepsy Res. 68 (Suppl 1): S65–9. doi:10.1016/j.eplepsyres.2005.07.018. PMID 16413756. Hutchison LC; Jones SK; West DS; Wei JY (June 2006). "Assessment of medication management by community-living elderly persons with two standardized assessment tools: a cross-sectional study". Am J Geriatr Pharmacother. 4 (2): 144–53. doi:10.1016/j.amjopharm.2006.06.009. PMID 16860261. Isaacs B (1965). An introduction to geriatrics. London: Balliere, Tindall and Cassell.